The French and Indian War represented the decisive turning point in British-colonial relations. The Treaty of Paris in 1763 ratified Britains undisputed control of the seas and shipping trade, as well as its sovereignty over much of the North American continent east of the Mississippi River, including French Canada. But a steep price accompanied the fruits of total victory. The British Government had borrowed heavily from British and Dutch bankers to finance the war, and as a consequence the national debt almost doubled from £75 million in 1754 to £133 million in 1763. In order to address this onerous liability, British officials turned to larger import duties on enumerated goods like sugar and tobacco, along with a series of high excise (sales) taxes on goods such as salt, beer, and spirits. This taxation strategy tended to burden consumers disproportionately. In addition, government bureaucracy expanded in order to collect the needed revenue. As the number of royal officials more than doubled, Parliament delegated new legal and administrative authority to them. Thus, even as British subjects lauded their pre-eminent position in the world, they chafed under the weight of increased debts and tightened government controls. Given Britains exertions on the North American continent for the sake of colonial security, both ministers and members of Parliament determined that the colonies were obligated to share the costs of empire. But the war exposed the weakness of British administrative control in the colonies on various fronts. In 1764, Parliament passed the Currency Act, which banned the use of paper money as legal tender in all colonies. British merchants had asked for relief from the depreciated currency brought about by deficit financing in Virginia. The act represented an effort to wrest control of monetary policy from colonial assemblies. The colonies faced a chronic shortage of hard money, which was being sent across the Atlantic to pay debts in England. To meet the shortage, they resorted to issuing their own paper money. British creditors, however, feared payment in such a depreciated currency. To alleviate their fears, Parliament in 1751 had forbidden the New England colonies to make their currency legal tender. Now Grenville extended the prohibition to all the colonies. The result was a decline in the value of existing paper money, since nobody was obligated to accept it in payment of debts, even in the colonies. The deflationary impact of the Currency Act, combined with new duties and stricter enforcement, delivered a severe shock to a colonial economy already suffering a postwar business decline. The colonies suffered a constant shortage of currency with which to conduct trade. There were no gold or silver mines and currency could only be obtained through trade as regulated by Great Britain. Many of the colonies felt no alternative to printing their own paper money in the form of Bills of Credit. But because there were no common regulations and in fact no standard value on which to base the notes, confusion ensued. The notes were issued by land banks, or loan offices, which based the value of mortgaged land. Some notes payed interest, others did not, some could be used only for purchase and not to repay debt. Some were issued only for public debts & could not be used in private transactions. There was no standard value common to all of the colonies. British merchant-creditors were very uncomfortable with this system, not only because of the obvious complexity, but because of the rapid depreciation of the notes due to regular fluctuations in the colonial economy. On September 1, 1764, Parliament passed the Currency Act, effectively assuming control of the colonial currency system. The act prohibited the issue of any new bills and the reissue of existing currency. Parliament favored a "hard currency" system based on the pound sterling, but was not inclined to regulate the colonial bills. Rather, they simply abolished them. The colonies protested vehemently against this. They suffered a trade deficit with Great Britain to begin with and argued that the shortage of hard capital would further exacerbate the situation. 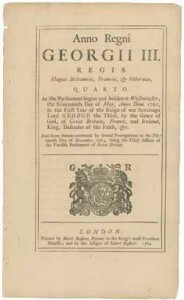 Another provision of the Currency Act established what amounted to a "superior" Vice-admiralty court, at the call of naval commanders who wished to assure that persons suspected of smuggling or other violations of the customs laws would receive a hearing favorable to the British, and not the colonial, interests. This act was not repealed prior to the American Revolution. It had very dire consequences for both North Carolina and South Carolina, both of whose economies were already shaky. The Currency Act was, therefore, a great hardship to trade within and without the colonies and, equally important, proof that the British government put the interests of mother country merchants ahead of theirs. The entire text of the Act is provided below. II. And whereas the great quantities of paper bills, or bills of credit, which are now actually in circulation and currency in several colonies or plantations in America, emitted in pursuance of acts of assembly declaring such bills a legal tender, make it highly expedient that the conditions and terms, upon which such bills have been emitted, should not be varied or prolonged, so as to continue the legal tender thereof beyond the terms respectively fixed by such acts for calling in and discharging such bills; be it therefore enacted by the authority aforesaid, That every act, order, resolution, or vote of assembly, in any of the said colonies or plantations, which shall be made to prolong the legal tender of any paper bills, or bills of credit, which are now subsisting and current in any of the said colonies or plantations in America, beyond the times fixed for the calling in, sinking, and discharging of such paper bills, or bills of credit, shall be null and void. III. And be it further enacted by the authority aforesaid, That if any governor or commander in chief for the time being, in all or any of the said colonies or plantations, shall, from and after the said first day of September, one thousand seven hundred and sixty four, give his assent to any act or order of assembly contrary to the true intent and meaning of this act, every such governor or commander in chief shall, for every such offence, forfeit and pay the sum of one thousand pounds, and shall be immediately dismissed from his government, and for ever after rendered incapable of any public office or place of trust. IV. Provided always, That nothing in this act shall extend to alter or repeal an act passed in the twenty fourth year of the reign of his late majesty King George the Second, intituled, An act to regulate and restrain paper bills of credit in his Majesty's colonies or plantations of Rhode Island and Providence plantations, Connecticut, the Massachuset's Bay, and New Hampshire, in America, and to prevent the same being legal tenders in payments of money. V. Provided also, That nothing herein contained shall extend, or be construed to extend, to make any of the bills now subsisting in any of the said colonies a legal tender.